For over 15 years, Dan Stanford and Christopher Hildebrand called each other friend. The two men now call each other roommate since moving into a comfortable, two-bedroom Raleigh apartment last October. 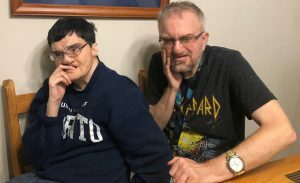 Stanford, 49, and Hildebrand, 44, are living independently – on their terms with the help of their families, friends and Monarch support staff in a supported living environment. Community Solutions Team Leader Michelle Lawrence, who works closely with the Stanford and Hildebrand families as well as other families in the greater Raleigh, Clayton and Chapel Hill areas, explained that the new roommates secured the apartment and oversee the living environment with the help of family, friends and support services. 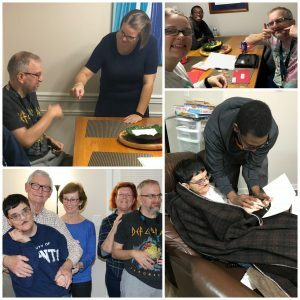 “We provide the supervision, health and safety monitoring and the hiring of the community specialists,” Lawrence explained of Monarch’s role in the supported living model. Because of health care needs, Stanford requires 24-hour staff supports, while Hildebrand is assisted during hours he is awake. Both men previously resided in group residences through other North Carolina agencies. An amendment to North Carolina’s Innovations Waiver in 2016 expanded the scope of available services to include a supported living option, opening doors for individuals with intellectual and developmental disabilities (I/DD) to live in their own homes with the supports they choose. Believing that supported living could be an option, the Stanford and Hildebrand families researched the living situation that seemed to closely align with what Christopher and Dan desired. The availability of community support specialists trained in American Sign Language (ASL) was also a priority because both Dan and Christopher are deaf. Stanford and Hildebrand initially formed their friendship when they both attended the same day program. However, through the years, their lives took different paths. A care coordinator with Alliance Behavioral Healthcare, who has worked with both men and their families, facilitated communication to put the two families in contact again. Their families organized a summer get-together letting old friends become reacquainted. Their friendship picked up where they left it while their families pursued supported living options that were available. Dan’s parents, Andree and Bill Stanford, searched for a residence nearby for their son who is also visually impaired and autistic. Christopher’s older sister and guardian, Michelle Hildebrand Roberson, sought more personalized living arrangements for her sibling who is also deaf and autistic. While transitioning from the group home to their current apartment, Roberson’s brother lived with her family. Currently, Stanford and Hildebrand attend separate day programs throughout the week coming home to their apartment at the end of the work day. They are typical roommates who enjoy watching movies, making dinner and helping each other out. Both Roberson and the Stanfords are delighted when they see photos of the roommates’ activities such as decorating the Christmas tree, writing out holiday cards and experiencing outings. The community specialists who assist Stanford and Hildebrand include the following: Bryron Newberry Taylor, Jessica Urcuiolio, Shannon Hinton, James Shelton, Jr., Amanda McCurdy, Amanda Knotts and Crystal Hunter. Members of the support staff team are either deaf and proficient in ASL, or in the process of acquiring proficiency in ASL. Photo caption at top: Dan Stanford, left, and Christopher Hildebrand, right, in the kitchen of their new supported living apartment in Raleigh. Photo collage: top left, Jessica Urcuiolio, standing, fist bumps Hildebrand in affirmation; bottom left, from left to right, Dan Stanford, Bill Stanford, Andree Stanford, Michelle Roberson, and Chris Hildebrand, pose in the new apartment; bottom right, at left, Stanford works with Community Specialist Bryron Newberry Taylor; top right, from left, Urcuiolio, Taylor and Hildebrand write out holiday greeting cards.